Mene & Moy Facial Facial Lotion C20 works to protect against skin becoming slack and wrinkled and uneven or blotchy skin-tone. 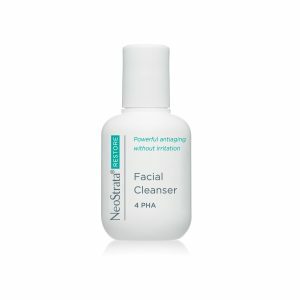 Skin becomes firmer, more resistant with a glowing complexion. 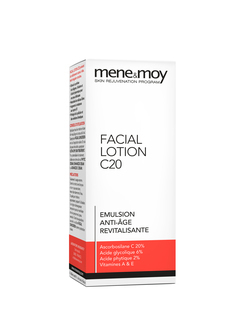 Mene & Moy Facial Lotion C20 works to protect against skin becoming slack and wrinkled and uneven or blotchy skin-tone. To enhance results, use a night cream such as Phytic Cream, Enhanced Cream or Advanced C Cream. Facial Lotion C20 should be applied every morning as a make-up base and around the eyes. Water (Aqua), Ascorbyl Methylsilenol Pectinate, Glycolic Acid, Propylene Glycol Celeth-3 Acetate, Propylene Glycol, Ammonium Hydroxide, Phytic Acid, Shea Butter (Butyrospermum Parkii), DEA-Cethyl Phosphate, Tocopheryl Acetate, Retinyl Palmitate, Cholesterol, PEG-40 Stearate, Cethyl Alcohol, Glyceryl Stearate, Green Tea (Camellia Oleifera Seed)Extract, Grape (Vitis Vinifera) Seed Extract, Magnesium Aluminum Sillicate, Sorbitan Stearate, Xanthan Gum, Diazolidinyl Urea, Citrus Fragrance, Soybean Protein, Sorbic Acid, BHT.